Mountain Hiking at Its Best! Colorado hiking vacations begin in the town of Estes Park, Colorado which is known as the gateway to Rocky Mountain National Park. It's a wonderful place to start your mountain hiking vacation! I'll tell you where you can stay, where to eat, and which Colorado hiking trails lead to sparkling lakes, tumbling waterfalls, possible wildlife sightings, and numerous other beautiful areas. Many of the Colorado State Parks are located in the mountains and they offer you another great place to enjoy mountain hiking as well as camping. Some of them are full of aspen trees and you know what that means: great fall color hiking. So don't forget to bring your camera! And if you think you might be interested in booking a tour of some sort, just click on the below link for Viator, which I'm partnering with. (They are a TripAdvisor company.) They have a lot of tours in Colorado, and I'm pretty sure you'll find one to your liking :-). Have you heard of the Maroon Bells? If not, you have now...they are located near Aspen and are considered to be the most photographed peaks in Colorado, and possibly the United States. They are beautiful any time of the year but especially so in the fall, when the aspen trees turn gold and the whole scene is reflected in Maroon Lake. 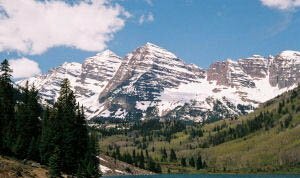 The above picture of the Maroon Bells was taken in the spring, and they are equally beautiful then too. Are you wondering where you could go for a Colorado weekend getaway where you could hike? There are lots of places like that which are within reasonable reach of the Denver area. Colorado Hiking Vacations will also show you different types of Colorado lodging such as lodges, cabins, and hotels, including pet friendly hotels where your pet is as welcome as you are. Obviously, you'll need to eat while you're here so I'll give you a sampling of some of the restaurants that we've tried, and liked; including a few that come with a lovely view. We also like to take sandwiches with us when we go hiking. So, I've started a page of sandwich recipes...it's great to arrive at a waterfall or alpine lake, sit there, relax, and eat your sandwich! Anyway, if you're planning a Colorado hiking vacation, I invite you to explore this site; it's here for you! And speaking of exploring, if you are looking for information on hiking Colorado's 14ers, try the link in this sentence. You'll find good information there for hiking a few of those big mountains. Site Updates: The most recent information on this site is a new hike I just added to my Indian Peaks Wilderness page. This trail is a 2.3 mile one-way moderate hike up to the Fourth of July Mine. It's a rocky trail that includes wildflowers, (mid to late July), cascading waterfalls, and beautiful mountain vistas. At the end of your hike, you'll see what's left of some old mining equipment, and that will be your turn-around point. If that sounds interesting, it's the 6th hike down on the above linked page. 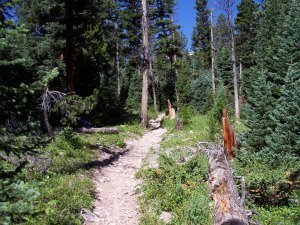 Enjoy, and I hope these trails will be a fun part of your Colorado hiking vacation :-).